This article is the first in an occasional series profiling candidates running for various offices and how their election might impact our communities. 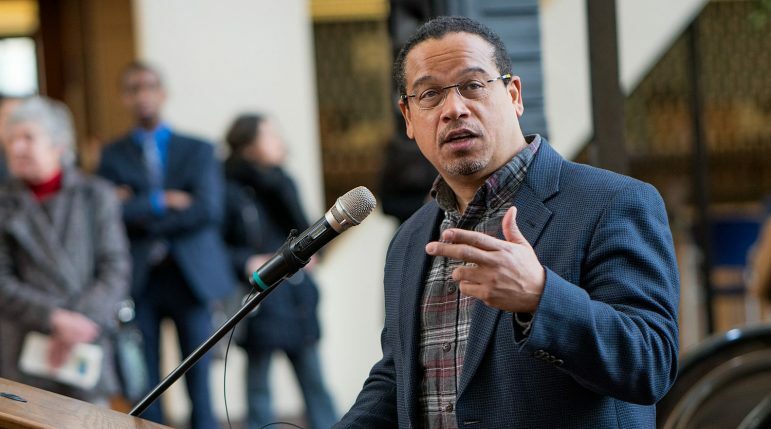 Hours before the 5 pm June 5 filing deadline to run for office in the upcoming Minnesota elections, DFLer Keith Ellison made headlines by announcing his run for Minnesota Attorney General (AG). “It’s something that I’ve been thinking about for a long time,” said Ellison. He attributed his decision to incumbent AG Lori Swanson dropping out of the AG race to run for governor. Ellison said he decided to run because as AG he will have an opportunity to serve more people more directly and more quickly than he could as a congressman. Since 2007, Ellison has served as the U.S. Representative for Minnesota’s Fifth Congressional District. He was the first Muslim elected to the U.S. Congress, and he has been the deputy chair of the Democratic National Committee since 2017. What is the most important thing you want to accomplish when you get into office? I want to help working people keep the money that they earned, either as consumers or workers or small business people or farmers. I want to make sure that hard-working people know that in this economy they’re going to have an advocate that is going to make sure that they are treated fairly, and I also want people to know as a citizen, as a resident of our community, you are going to be treated fairly. So, I will be standing up for people’s economic and civil rights. What is the greatest impact your position will have on the African American community? More money. If you look at the racial wealth gap, much of it is explained by a few things. One is the Black community, [which] was devastated in the 20008 foreclosure crisis. Wealth and equity was stripped out of people’s family budgets because they lost their homes to foreclosure because of unfair and predatory terms. If you look at student loans, more Black students depend upon on them to go to school, and they depend on them to a higher degree than White students. If you look at environmental justice, more Black people live in areas that have pollution and that, of course, has an economic impact – whether it’s asthma, lead exposure, or whatever. So, an aggressive AG looking out for all citizens, including the Black community, is going to have the impact of having more money in the pockets of those families and also as citizens. As AG, I will make sure that justice is fair to everyone, and I will be working in our courts and all over the system of justice to make sure that it is fairly administered to everyone. And that’s been my history over the course of my entire adult life, like when I ran the Legal Rights Center, when I represented people in landlord-tenant court and as a state and federal legislator. What is the most controversial issue you think you will have to deal with if you get in office and how are you going to deal with it? Whenever the state AG has to confront corporate power, it is going to be controversial in the eyes of somebody. So, making sure that people are treated fairly by the large entities, by the McDonald’s, by the 3Ms, by the Wells Fargos, that’s going to be controversial. I think it will also be important that the state AG try and offer some leadership on police-community relations; I expect that will be controversial. There will be other issues involving the justice system that will clearly be controversial, but that is why you need an AG that has the courage to stand up and do what’s right. How do we get money out of politics? One thing we need to do is, any publicly traded company should have to pass a resolution approved of by the shareholders specifically outlining what the money is going to be used for before an expenditure can be made in politics. I mean, one of the big ironies of the Citizens United decision is that is not really corporations that have freedom of speech, it is CEOs that have it, and the CEO is not the corporation. The corporation is all the shareholders together, and yet in my view, they’re being ignored. Basically, their dividends are lower, their expenditures are higher, because some CEO has their own political agenda they’re trying to pursue, and that ain’t right. My retirement should not come at the expense of some CEO Jones’ political views. What do you say to people who say they don’t like politics and politicians? I would say, well, do you like having to abide by laws and rules that you don’t agree with? Because just because you don’t like politics or politicians doesn’t mean they’re not going to be there, and it doesn’t mean that they’re going to stop doing things that you don’t like. If you want to help shape this society to be fairer, to be more just, to be more equal, to have more opportunity for people like you, then you have to get political. Otherwise, you’re just saying that I’m okay with someone else deciding my fate, and that doesn’t make much sense to me. What’s your favorite thing about Minnesota? The people – kind people, caring people, [with a] tremendous sense of civic engagement. I really love that about the people in the state of Minnesota. What elected officials (past or present) in the state do you most admire who serve as role models for you? Nelly Stone-Johnson was just a wonderful organizer. She was fighting for civil rights, labor rights way back in the day and was a courageous woman, and I was lucky enough to get to know her. Also, Paul Wellstone is somebody I admire tremendously. Neva Walker was a great state representative and the first Black woman ever elected to the Minnesota State Legislature. She’s smart, she’s strategic, has a very strong sense of values. She has now moved to California, but she is a wonderful person; I definitely admire her. Interview conducted by Keith Schubert. Other candidates running for this office include Tom Foley (DFL), Debra Hilstrom (DFL), Noah Johnson (Green), Robert Lessard (R), Matt Pelikan (DFL), Mike Rothman (DFL) and Doug Wardlow (R).